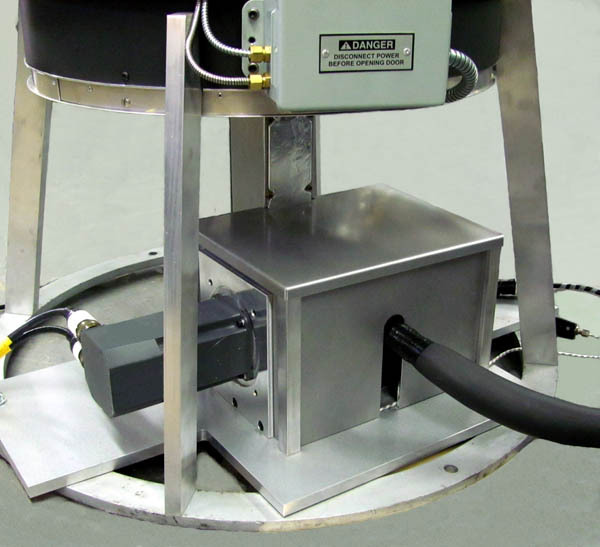 SRD i-Series Metering, Mixing and Dispensing Machines typically include two precision rotary gear metering pumps, which are mounted directly below each heated and agitated material preparation tank. Each metering pump includes an independent, digital, servomotor drive. The metering pumps are selected and sized to match your specific ratio and output requirements. The SRD i-Series is a simple, affordable solution for urethane casting applications that demand accuracy, continuous flow, easy operation and minimum maintenance. Batch curative and resin degassing tanks can be used to supply your heated, agitated and degassed material to this i-Series machine’s precision rotary gear metering pumps. Driven by independent servo drives, the rotary pumps meter two-components on-ratio to the variable-speed Dynamic Mixer. Integrated closed-loop speed control maintains preset metering pump speeds at +/- .01% accuracy. The operator can dispense mixed material at preset output rates or dispense preset shot volumes into molds of various sizes and shapes. 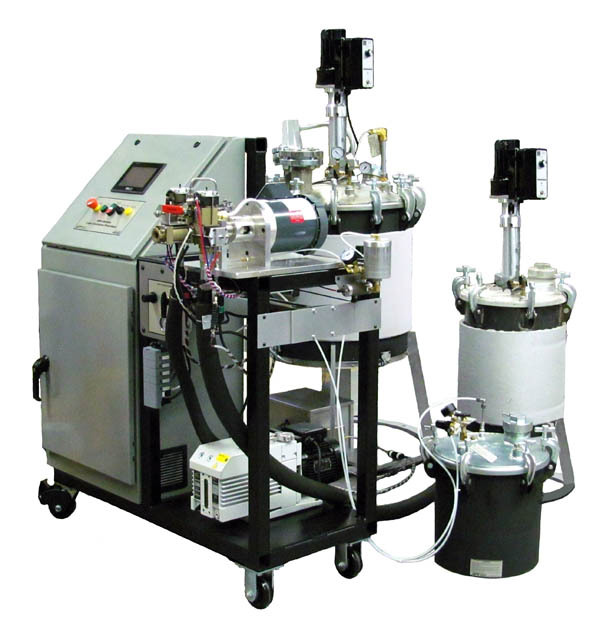 In place of batch tanks, APT’s Continuous Thin-Film Prepolymer Degassers deliver heated and air-free materials on-the-fly to the SRD i-Series machine under constant vacuum. 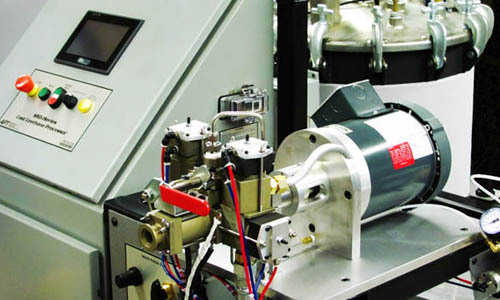 On-Demand Quik-Melt MOCA Curative Melters can also be connected to this SRD i-Series system. Note that when simple batch heating and degassing tanks are used to feed materials to the i-Series machine, the constant positive material feed pressure from the batch tanks to the mixer is created by applying dry nitrogen over-pressure to the tanks. handle unfilled cast urethane, epoxy, polyester and cast nylon formulations. 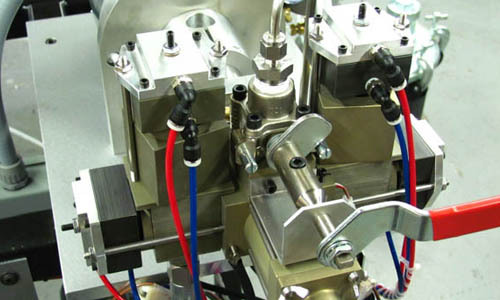 These systems are also used in open-casting, low-pressure VARTM (Vacuum-Assisted RTM) and high-pressure, closed-mold, RTM resin injection applications. All heated compartments for the pumps and the mixer are made of removable slide-out panels. Heaters are ceramic-enclosed infrared type. Power-operated component injectors and convenient ratio-taking ports are located at the dynamic motor driven mixer.